A few weeks back we interviewed Barbie Sommars for our Cannabis Corner. We talked a bit about me not having experience in cannabis consumption with exception to smoking when I was in high school for a very short time. She invited me to her high dining experience, Moonlit Moveable Feast. I decided to jump into the cannabis culture headfirst. I went to see Dr. Kao at Greensight in Rancho Mirage and see if cannabis would be good for me. My concerns were being consistently paranoid when I was high. That was the main reason I stopped. It turns out cannabis can be used to prevent mild anxiety if the right strain is used. Also, I found cannabis may be helpful to my accident induced headaches. With my recommendation in hand, I was ready for my first experience with cannabis consumption at Moonlit Moveable Feast. I pulled up to the venue and immediately knew this was going to be a great experience. It was off the beaten path in the middle of Joshua Tree. It was an art compound like none I’ve seen. In the entrance were 2 glass blowers making trinkets and smoking devices. I stopped to watch a bit since, although I wasn’t a smoker, I’ve always love glass art. I’ve always found pipes to be beautiful and intricate. After receiving a “Deadhead” skull necklace charm (for free! ), I went inside to find Barbie. Barbie gave me a tour of the compound and introduced me to the chef, Sabrina Phelps. I arrived before sunset and was lucky enough to grab a few terpene infused martinis from Levi Strom of Awakened Topicals. I figured this would be a great way to start my cannabis consumption. I soon learned terpenes are sort of the essential oils of cannabis and contain no psychoactive properties. I was okay with just the flavor of cannabis and the psychoactive properties of Tito’s vodka though. 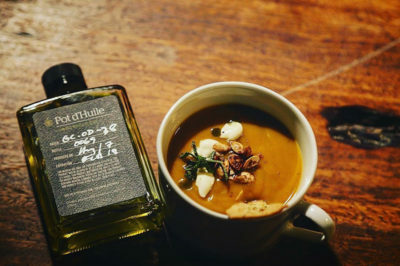 My first foray into consumption came in the form of a winter squash soup with sage infused cannabis oil. It was perfect timing. This 1st course came right at sunset. It also acted as a catalyst for conversation. I was taken aback by the “dos” and “don’ts” of cannabis verbiage. I asked about thoughts of “recreational” legality, and was quickly corrected. It is “adult consumption,” “not “recreational.” I found out it is very important to refer to cannabis consumption as the laws refer to it. There is still a heavy gray area when it comes to cannabis laws. Many states are legalizing medical and recreational use, but federally, it is still illegal. This also led to the “flower” sampling area of the compound. I may be an amateur, but this term was obvious. I did giggle a bit at the term, since I always referred to it as “weed” or “bud.” Smoking weed has become “flower tasting.” It made me feel like I was in a crowd full of families and the parents were trying to be clever with their wording so that the children didn’t know the adults were talking about smoking weed. After a half hour of conversations with the most accepting and intriguing people I’ve had the pleasure to spend time with, I realized my initial anxiety was weaning. I was worried about this crowd being a bunch of elitists who didn’t except somebody who wasn’t “in the know.” I couldn’t be more wrong. Everybody was eager to talk and intrigued by the notion of me going from no cannabis experience to this high dining experience without batting an eye. We all slowly made our way to the outdoor dining table and continued our conversation over the 2nd course, a super food salad, and a sound bath emanating from the building next door. 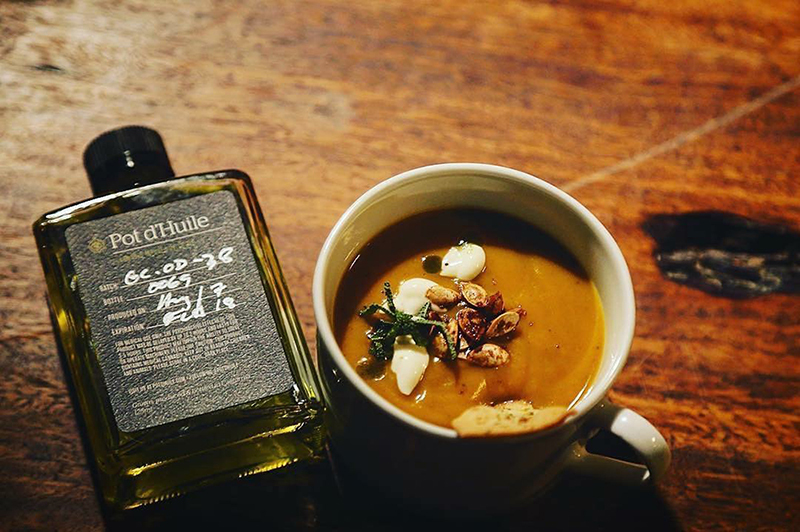 The whole experience was very soothing… or maybe it was the winter squash soup and martinis kicking in. The third course was an amazing roasted chicken breast with an infused pomegranate salsa. Sabrina Phelps was introduced to us by our gracious hosts Keiko. She explained the meal and talked about how there was a very low dose of cannabis in the meal. It was only 10mg of THC. I have no idea what this meant except for apparently it was more than likely the martinis kicking in. After Sabrina, we listened to Royce Robertson of Joshua Tree Coffee Company explain the complexity of coffee and what they had available. This seemed like a perfect way to end dinner. I took full advantage of the coffee and sat down to enjoy some live music. My night ended with a journey out to the sound telescope. A gentleman had an array of telescopes to look at the full moon, and had one that transformed light into sound. Side note, the moon has a beautifully eerie sound. Once everybody was done with their coffee and exploring, they all sort of congregated to the telescopes and “flower sampling” area. I was not ready to dive that deep on my first experience, so I used the opportunity to politely make my exit. I couldn’t be more surprised at how extremely accepting this community was. Let alone the great company, the experience of a high-class dinner under the full moon, in the middle of the desert, at an artist compound, was the most enjoyable way to spend my evening.